632. Their nature. Destined to become seeds in the fruit ovules are understood to be altered buds. Their development from the margins and inner surface of the carpel favors this view; for the ordinary leaves of Bryophyllum and some other plants do habitually produce buds at their margin or on their upper surface; and in the mignonette ovules themselves have been seen transformed into leaves. 406, Pistil of Celosia, the pericarp detached showing the young ovules. 413, Flower of Rhubarb; pericarp removed showing the young ovule. 407, A similar ovule (orthotropous) of Polygonum. 40S, The same, full grown; foramen at top. 409, Section showing its two coats, nucleus and sac. 410, Anatropous ovule, as of columbine; a, foramen. 411, Section of same. 412, Campylotropous ovule, as of Bean; a, foramen. 414, Section of a cherry, ovule anatropous, suspended. 415, Section of carpel of Ranunculus; ovule ascending. 416, Senecio; ovule erect. 417, Hippuris; ovule pendulous. 533. The number of ovules in the ovary varies from one to hundreds. Thus in buttercups, Compositae and grasses the ovule is solitary; in Umbeliferae it is also solitary in each of the two carpels; in the Pea Order they are definite, being but few; in Mullein, Poppy, indefinite (∞), too many to be readily counted. 534. 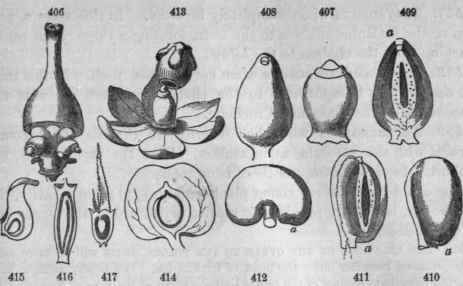 The position of the ovule in the cell is defined by certain terms as follows; erect, when it grows upwards from the base of the cell, as in Compositae; ascending, when it turns upwards from its point of lateral attachment; horizontal, when neither turning upwards nor downwards; pendulous, when turned downwards, and suspended, when growing directly downwards from the top of the cell, as in birch. (415, 416,417,419). 535. The ovule at the time of flowering is soft and pulpy, consisting of a nucleus within two coats, supported on a stalk. The stalk is called funiculus; the point of its juncture with the base of the nucleus is the chalaza. The nucleus was first formed, then the tegmen or inner coat grew up from the chalaza and covered it, and lastly the outer coat, the testa, invested the whole. Both coats remain open at the top by a small passage, the micropyle. 537. Anatropous when completely inverted. In this state a portion of the funiculus adheres to the testa, forming a ridge called raphe, reaching from the chalaza to the hilum. 538. It is campylotropous when curved upon itself. In this state the micropyle is brought near to the chalaza, and both are next the placenta, as in the pinks and Cruciferae. 539. Amphitropous when half inverted, so that its axis becomes parallel with the placenta, as in mallow. Here the raphe exists, but is short. In campylotropous there is no raphe. The ovule contains no young plant (embryo) yet; but a cavity, the embryo sac, is already provided to receive it just within the upper end of the nucleus. 540. The relations of the ovule to the pollen grain will be more suitably discussed hereafter under the head of fertilization. We briefly remark here that the immediate contact of the two is brought about at the time of flowering by special arrangements; and that, as the undoubted result of their combined action, the embryo soon after originates in the embryo sac.